The scientific report “Length-based assessment of the spawning potential of reef fish from iQoliqoli Cokovata, Macuata Fiji” is part of the WWF-Pacific Sustainable Seafood Project (funded through Le Cordon Bleu New Zealand Institute and the New Zealand Aid Programme). The study was led by Dr Jeremy Prince of Biospherics Pty Ltd. 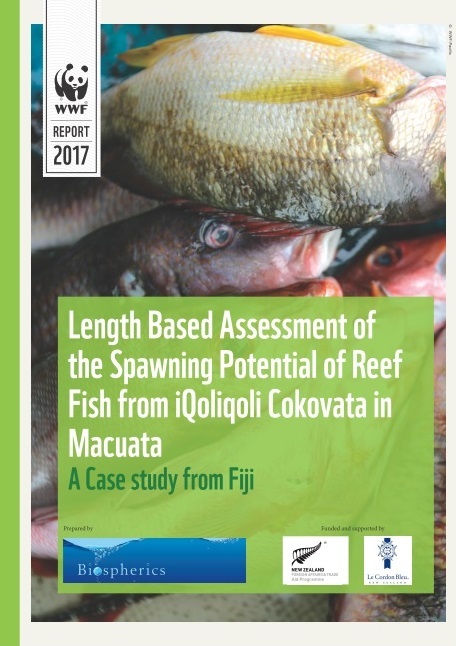 This report describes the application of a new technique for assessing the status of reef fish stocks in the iQoliqoli Cokovata fishery in Macuata. The fishery covers an area 2,041 square km on the central north coast of Vanua Levu and is utilized for subsistence by 24 villages, and until recently approximately 400 commercial permit holders as well. These results confirm that Fiji is facing the same crisis of sustainability with its reef fish as are other Pacific island nations. If Fiji does not significantly reform its management of fisheries, it is predicted that all the most valuable commercial and food fish species will be depleted to extremely low levels and become insignificant for livelihoods and subsistence, and probably locally extinct through most of Fiji. The stakes are high for the future of Fijians, and Fiji needs to get this right.